BULAWAYO, Zimbabwe, Oct 20, CMC – Head coach Stuart Law is envisioning a trial by spin when West Indies clash in the opening Test against Zimbabwe starting here Saturday. “This is a Test venue. The wicket here is traditionally very good for batting and spins more and more as the game goes on, so to me that’s a pretty decent Test pitch,” the Australian said of the conditions at Queens Sports Club venue. The 16-man Zimbabwe squad comprises the likes of leg-spinner Graeme Cremer, left-arm spinners Sean Williams and Tendai Chisoro, along with Malcolm Waller and Sikandar Raza who can both bowl off-breaks. 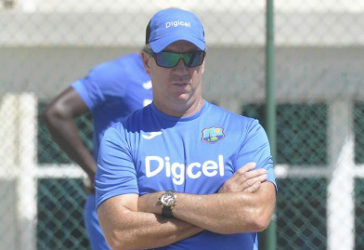 West Indies coach Stuart Law. And with West Indies having shown a weakness to slow bowling in the recent past, Zimbabwe will be hoping to use the conditions to their favour. However, Law said the Windies boasted a balanced attack, with fast bowlers who could pose problems on any surface. “We’ve got two or three guys who can crank it up to over 90 miles per hour and that pace doesn’t really matter where you play, it’s hard work to bat against them,” Law pointed out. Leg-spinner Devendra Bishoo is the Windies’ only specialist spinner but part-time off-spinners Roston Chase and Kraigg Brathwaite – both of whom boast five-wicket hauls in Tests – will be expected to play key roles. Law said the team selection would be based on the conditions at Queens Sports Club. West Indies will bank on their knowledge of conditions at the venue, after playing three matches there last November in the Tri-Nations Series involving Sri Lanka and the hosts. While they failed to get a win, losing two and tying one of those encounters, Shai Hope managed a hundred while Brathwaite carved out a half-century. Captain and seamer Jason Holder and Bishoo were also among the wickets but Law cautioned that the Test arena could prove a different challenge. “It is different in the sense that it was a one-day tournament but I think they understand that the first couple of games they played the wickets were very good and as the tournament wore on, the pitches got harder and harder to bat on as they spun more,” he explained. “Being familiar with the ground and having success at the ground [is important]. A few guys have done well here, that always helps as well but every series is different.